I had these pancakes three times this week. Then I realized they’d be perfect for Mother’s Day (or the perfect treat for Moms to make for themselves any day!) so I decided to post the recipe. The coconut milk in these pancakes makes them so thick and sweet and decadent-tasting, I had to add an extra “Cake” to the title of this post. They have a lot of good-for-you ingredients and they’re very filling too, so, honestly, my husband and I like to eat them as a quick and easy weekday dinner. Here’s everything you’ll need to make these pancakes. Mostly pantry items you may already have on hand. First, put just enough canola oil in a large frying pan to cover the bottom of the pan. Turn the burner to medium heat and allow the pan to heat up for a minute or two. Meanwhile, grab a large mixing bowl and add all the following: whole wheat flour, a bit of all-purpose flour, baking soda and baking powder (to help these pancakes get extra thick and fluffy), an egg, an egg white, some coconut milk, a bit of sugar, a bit of salt, and some vanilla extract. At this point the frying pan should be hot. Use a 1/3 measuring cup to ladle a scoop of the batter onto the pan. 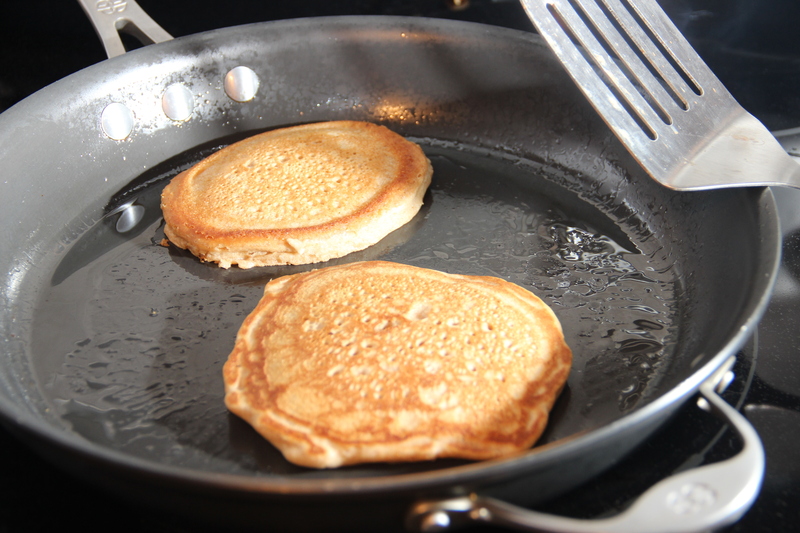 You may have enough room on your pan to cook two pancakes at once. When you notice lots of bubbles forming throughout the pancake, both around the sides as well as in the center, it’s ready to flip. Flip the pancakes with a spatula. They should be lightly golden. Allow the pancakes to cook for just a couple of minutes more on the second side. Then transfer the pancakes to serving plates. After you’ve finished cooking up all the pancakes, turn off the heat completely. 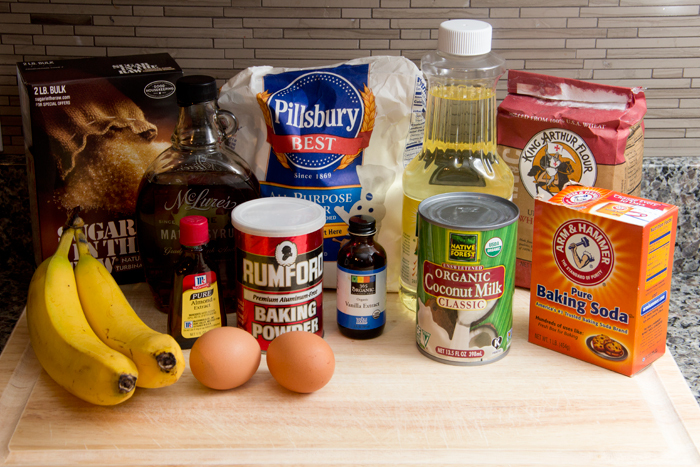 Then slice a few bananas and grab some pure maple syrup, some vanilla extract, and some almond extract. The syrup should be 100 percent pure maple syrup. Pure maple syrup (versus the processed kind that often has water and corn syrup and tons of other additives) tastes so good and it’s actually a healthier natural sweetener. Pure maple syrup has a lot of zinc (for a healthy immune system), antioxidants, and (surprisingly!) calcium. So it’s a smarter, healthier choice to sweeten your pancakes. And the rich, velvety flavor tastes so perfectly delicious with bananas. After a couple of minutes, the frying pan should have cooled down a bit. 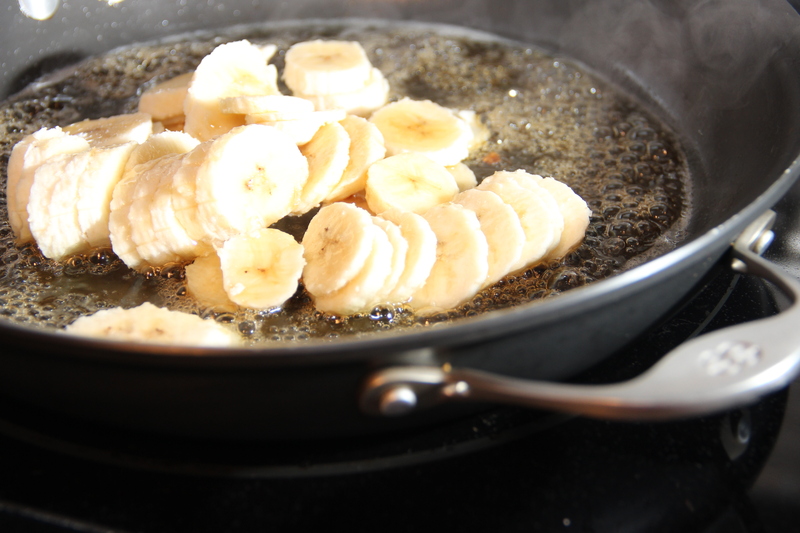 Add the bananas and maple syrup to the pan. The pan should still be slightly hot so that the syrup sizzles slightly when it hits the pan. Add the vanilla extract and the almond extract and stir everything together. Then top each plate of pancakes with the maple-glazed bananas. Perfect! These pancakes are such an indulgent treat. They’re thick and fluffy and sweet with just a hint of coconut flavor. And the maple-glazed bananas are richly flavored and the perfect complement. 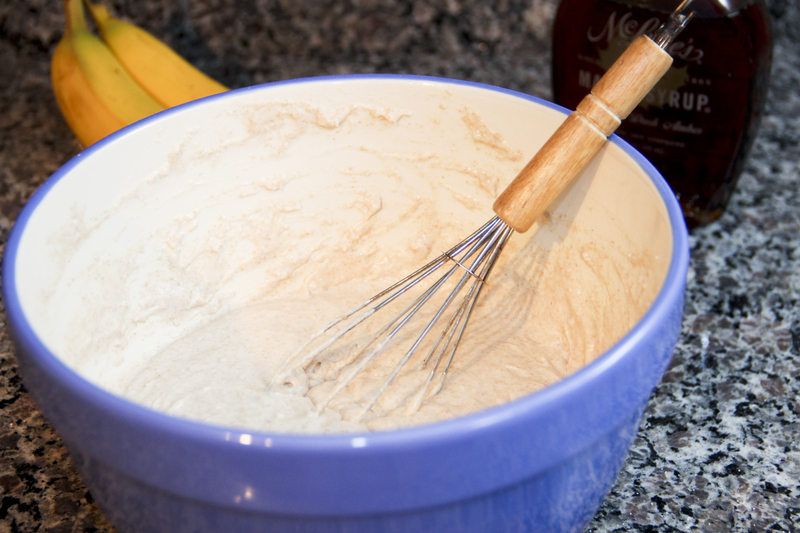 Add all ingredients for the Coconut Cake Pancakes in a large mixing bowl. Stir with a whisk just until well-combined. Heat the canola oil in a large frying pan over medium heat. 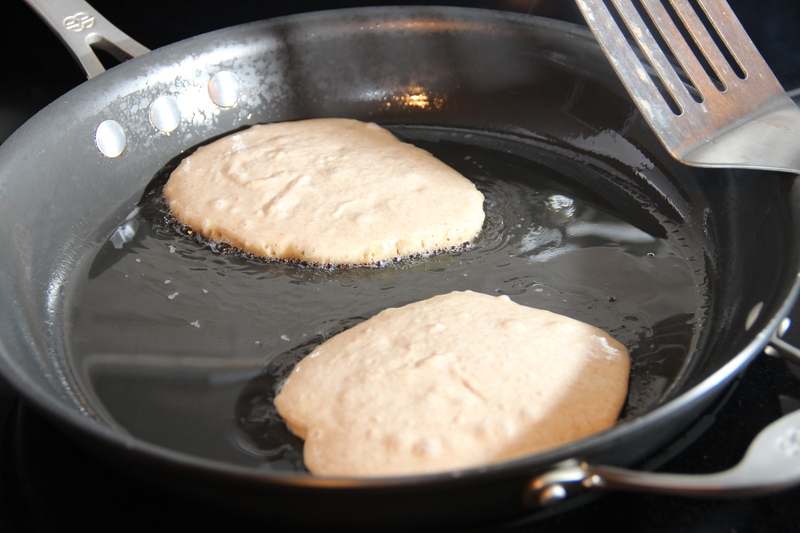 When the skillet is hot, pour about 1/4 cup of the batter onto the skillet. 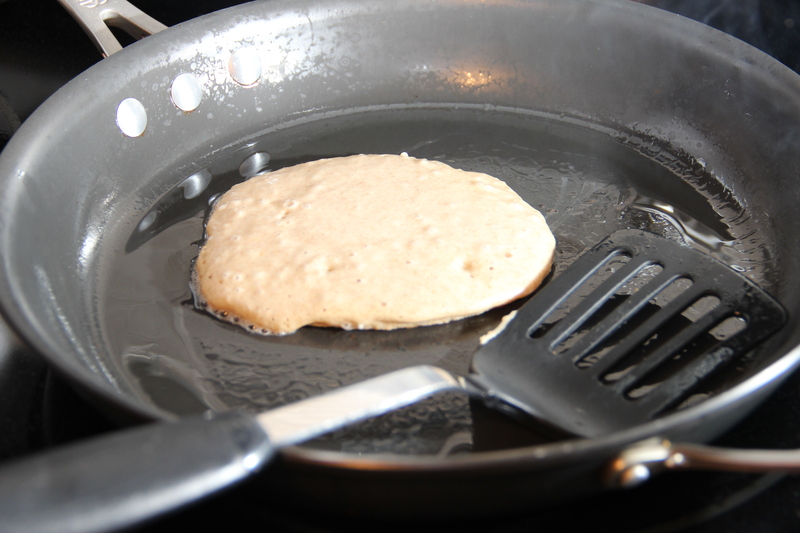 When bubbles begin to form in the center, after about 5 minutes, use a spatula to flip the pancake. Cook for about 3 minutes more, until the second side is light golden. Repeat until all pancakes are cooked. Turn off the heat and allow the skillet to cool for about one minute. Add the bananas and the maple syrup. The syrup should lightly sizzle when it hits the still-warm pan. Add the almond and vanilla extracts. Cook for about one minute, or until the bananas are well-coated with the maple glaze. 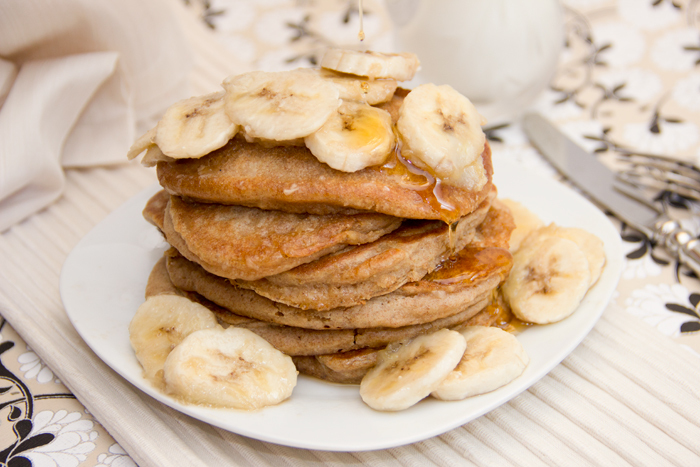 Top each pancake with some maple-glazed bananas and serve. They are so thick and fluffy! Looks delicious! Yes, the coconut milk adds such a rich flavor! I’ll try.. not for me… I’m on diet!! they seem to be good and really tasty!!!! No problem!!! Some of nu readers could not be’ on. Diet!!!! One of my best friends asked me the tanslation!!!! Love bananas like a money .. love pancakes like a kid … could you come and do them for me *smile – useless on pancakes – fantastic on snuffles. This more then Yummy!!!!! Will put it on file. My Swenglish is getting worst – fantastic on souffles it should be. So, sorry. Oh I see – was wondering what you meant by ‘snuffles’! Well, your English is certainly 3,000 times better than my second language (the French I learned in high school). Those look seriously delectable. I love the maple glazed banana idea, kind of like a bananas foster for pancakes. I have a huge pile of college students staying through this week, I’m going to make it for breakfast. I’ll let you know how quickly they were devoured! Oh my gosh! Those pancakes look so scrumptious! This looks like a must-try recipe! Great photos too! Pinning these for later for sure. These pancakes sound fantastic! Especially the maple-glazed bananas. LOve the tropical feel of these pancakes, your look very delicious, I love coconut!! Ooh…these look amazing. Maybe I’ll wake up to a plateful of these for Mother’s Day! I really like what you have done here. I love tropical foods and the coconut with the banana sounds delicious. 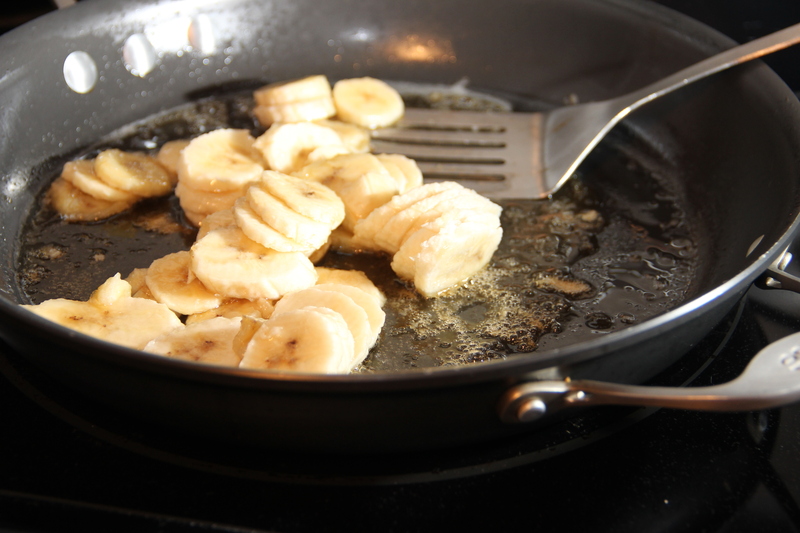 Also, the saute of the bananas is a perfect way to prepare them. Delicious breakfast! I tend to be a self-proclaimed pancake hater. But, maybe I just hate plain pancakes, or I’m not eating the right kind. I keep seeing recipes like this and really wanting to try them! The pancakes look terrific and if you had them three times in one week…that is all the recommendation that I need. These pancakes look amazing! Would love to lap it up. Now I am hungry!! These looks SSOOOO good! Three times in a week?!? You’re brave! Love your recipe with coconut milk! Okay, here’s my update. I had 9 college kids spending the night and so this morning I made these pancakes. They were a huge hit. I had to make 5 batches. These sound like the perfect mothers day pancake, I love the coconut milk added to the batter. So delicious. Pancakes are one of my favorite foods to play around with and come up with new ones. I recently made coconut pancakes and loved them. You should try cooking them in coconut oil, too – it’s great! I love the addition of the glazed bananas. I’m planning to buy some coconut oil next time I go shopping. I keep hearing about how great it is and can’t wait to try it! These sound so delicious! 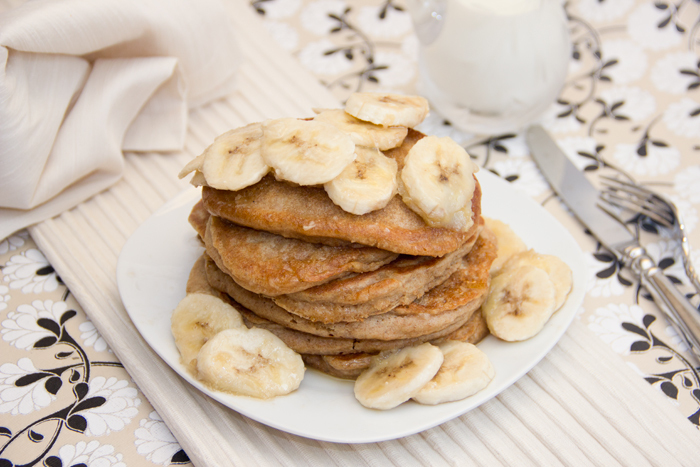 I do not eat enough pancakes – must change that starting with this recipe! Nice going, girly! These look fluffy, sweet, moist and delicious! I’d eat them 3 (ahem…7) times in a week too! I love how fluffy these are! I’m still searching for the perfect fluffy pancake…and it’s an added bonus that these are at least a little healthier than your average pancake. Thanks for the recipe! I love coconut and would not have thought to add them to pancake batter. They look delicious…it’s a long weekend in Toronto this weekend and these sound just perfect for Sunday brunch! These sound absolutely wonderful! 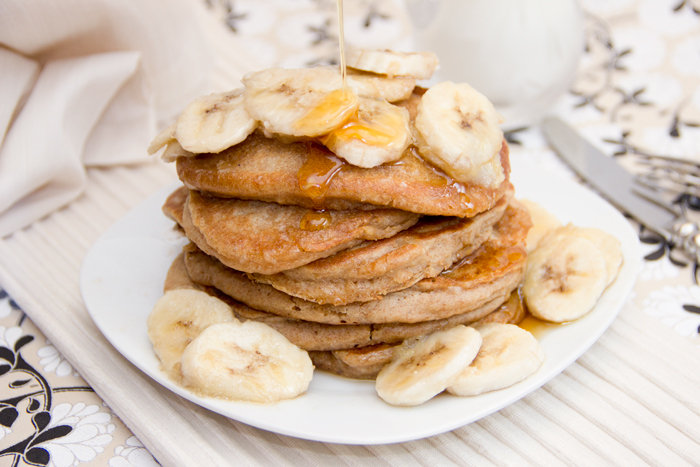 You can’t go wrong with bananas and pure maple syrup! I don’t blame you for having these three times! They’ve got to be hard to resist!